When you think of occupational health hazards, you most likely think of workplace injuries at a factory or other manual job. Occupational health hazards span the range of work settings, including the traditional office job. You may consider a paper cut to be the worst that could happen from your filing position! However, there are many office health hazards you have probably never considered. Eight hours a day at a desk doing little more than tapping your fingers on a keyboard does not bode well for your body. Technology may have increased our workplace productivity, but it has also given way to over 3 million reported yearly cases of repetitive stress injuries. These repetitive strain injuries include symptoms of tenderness, stiffness, numbness or tingling of the affected area. Caused by repetitive micro-movements, these injuries are cumulative and not easily detected day-to-day. With proper ergonomics and equipment, you can easily avoid these slow burning injuries. If you use a computer for the majority of your workday, you are susceptible to eyestrain. Too bright light levels in the office can contribute to dry, irritated and difficult to focus eye conditions. Consider closing blinds and windows and dimming lights when working on a computer. Also, the Occupational Safety and Health Administration encourages workers to take 10-minute breaks for each hour spent looking at a computer screen. Poor indoor air quality of office spaces is a major contributor to an increase in cases of respiratory disorders, chemical sensitivities and allergies. Lack of proper ventilation and airflow as well as overcrowding, water damage, mold, cleaning chemicals or pesticides and various other factors can contribute to poor air quality in the office. General cleanliness and proper maintenance of ventilation, heating and cooling systems can help prevent respiratory irritants, infections and illnesses around the office. Workplace demands create unavoidable pressure to stay motivated, alert and constantly learning new skills. This pressure, however, can easily become unmanageable, leading to stress. Stress easily damages health and performance, and most often occurs when an employee’s abilities do not match the employer’s expectations. You can avoid excessive stress by giving and receiving support from colleagues, improving organization and design, and creating satisfying working conditions. When we dive into cold and flu season, the importance of staying clean and healthy increases. Cold and flu season begins in December, reaching its peak in February. If you yourself are ill, the best course of action is to take a day sick day or work from home. The best option, however, is not always available. 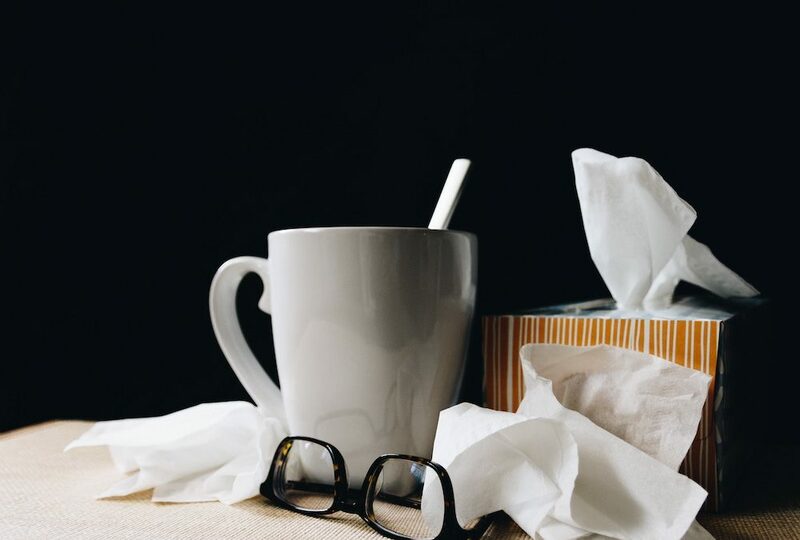 When dealing with a sick coworker at the office, we recommend washing hands frequently, avoiding touching your face, staying away from common areas and disinfecting frequently touched personal items. If worse comes to worst, simply ask your sick colleague to go home. They likely felt pressure to show up to work and will appreciate the permission to take care of themself. Keeping employees safe and healthy should rank highly on any company’s priority list. NDS Wellness does just that with both onsite and mobile clinics to provide quality healthcare directly to your workplace. This convenient care allows employees, like your sick coworkers, to receive annual wellness checks and other services onsite. If you are interested in having NDS Wellness provide health services to your self-insured company, contact us here.